The reusable rocket prototype Grasshopper built by private spaceflight company SpaceX makes a 6-foot test flight on Sept. 28, 2012. It's one small hop for a rocket, but one giant leap for reusable rocket ships: A private rocket prototype has sailed through a 6-foot hop that, while short, marked a major test for a novel reusable launch system being developed by commercial spaceflight company SpaceX. Called "Grasshopper," the rocket lifted off briefly then set back down on four spidery legs during the recent test at SpaceX's proving ground in McGregor, Texas. "The short hop of approximately 6 feet is the first major milestone for Grasshopper, and a critical step toward a reusable first stage for SpaceX’s proven Falcon 9 rocket," SpaceX officials said of the Sept. 21 test. 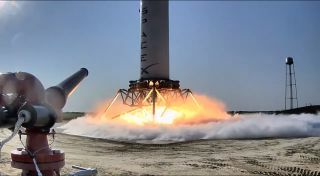 The Grasshopper rocket uses the first stage of SpaceX's successful Falcon 9 rocket, a two-stage booster that stands nearly 227 feet tall (70 meters) and is used to launch the company's Dragon space capsules and other payloads into low-Earth orbit. On Grasshopper, the Falcon 9 first stage is attached to a steel support structure that stands on four landing legs. The Sept. 21 test hop is just the first in a series of flight demonstrations, SpaceX officials said. The next major milestone — a 100-foot (33-meter) flight — is planned for sometime in the next few months. "We will see if this works," Musk said when he unveiled the project last year. "And if it does work, it'll be pretty huge." SpaceX's vision for reusable rockets consists of three major elements: a fly-back rocket first stage, a fly-back second stage and an orbital space capsule capable of landing on land. Unlike NASA's space shuttles, which were the first reusable spacecraft, SpaceX's reusable rockets would not use wings to make their descent. Instead, they would return vertically using their engines to make a pinpoint landing. While SpaceX's Dragon space capsules currently make water landings in the ocean like NASA's Apollo, Gemini and Mercury capsules, the company plans to upgrade them for surface landings to enhance their reusability. The Hawthorne, Calif.-based SpaceX is currently building Falcon 9 rockets to launch Dragon space capsules on unmanned cargo runs to the International Space Station under a $1.6 billion contract for NASA that calls for at least 12 flights. SpaceX also has lined up customers for unmanned satellite launches using its Falcon 9 rocket. The next Falcon 9 rocket to launch blasts off late Sunday (Oct. 7) carrying a Dragon capsule packed with 1,000 pounds (453 kilograms) of cargo for the International Space Station. The mission, which follows a successful demonstration flight last May, is SpaceX's first official cargo delivery flight for NASA. SpaceX officials are working on a manned version of the Dragon spacecraft in order to ferry astronauts to and from low-Earth orbit for NASA now that the agency's shuttle fleet is retired.